Carson Wentz has not fared well in game-winning drive situations early in his career. 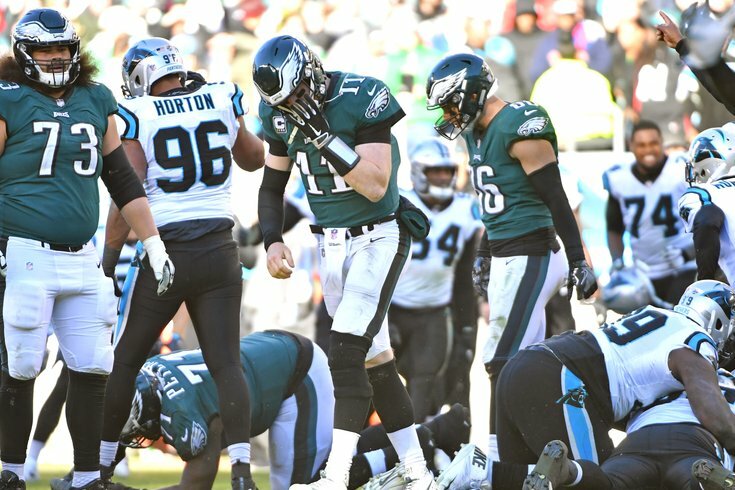 In the Philadelphia Eagles' disastrous loss to the Carolina Panthers on Sunday, Carson Wentz had a chance to drive the Birds down the field for a game-winning touchdown, but fell short. In Wentz's 34-game professional career, he has, by my count, had nine game-winning drive opportunities, which I'll define here as a drive in which the score was either tied or the Eagles were behind on the scoreboard in what was likely to be their last possession of the game. While Wentz has otherwise had a stellar start to his career, game-winning drives have not been his forte, as the Eagles have only won one of those nine opportunities. Here's a review of all nine. • Eagles at Lions, Week 4: The Eagles were down 24-23 after a Lions field goal with 1:28 to play. Starting from his own 25, Wentz launched a deep ball to Nelson Agholor on the first play of the drive that was intercepted by Darius Slay. The throw was off-target, and Wentz didn’t get much help from Agholor, who perhaps could have done a better job making sure nobody caught it. Loss. • Eagles at Redskins, Week 6: Down 27-20 with 4:05 to play, the Eagles started their drive at their own 30. They drove down to the Redskins’ 42 yard line, before Wentz took a pair of nine-yard sacks on 2nd and 6, and 3rd and 15. They punted on 4th and 24, and never got the ball back. Loss. • Eagles at Cowboys, Week 8: With the score knotted at 23 and 1:13 left to play, Wentz and the Eagles took over after a Dallas punt touchback at their own 20. A first down offensive pass interference call on Dorial Green-Beckham immediately stalled that drive, leading to a 3-and-out. The Eagles would eventually lose on the first possession of overtime. Loss. • Eagles at Giants: Week 9: We covered this one at length at the time. Trailing 28-23 with 1:48 to go after a Jordan Hicks INT set up the offense at the Giants’ 34-yard line, Steve Spagnuolo dialed up blitz after blitz. On 4th down at the Giants’ 17 yard line, Jordan Matthews got open just enough on a slot fade to give Wentz an opportunity to win the game with an on-target throw, but he missed a little to the outside, and the Giants took over on downs. Loss. • Redskins at Eagles: Week 14: Down 27-22 with 1:53 to go, the Eagles took over after a Redskins go-ahead touchdown at their own 25. Wentz put together a nice drive initially, but it came crashing down when a hurt Matt Tobin filling in at RT gave up a strip sack turnover to Ryan Kerrigan after the Eagles had entered the red zone. Loss. • Eagles at Ravens: Week 15: Facing a 27-20 deficit with 1:39 at their own 41, Wentz marched the Eagles down the field on a nine-play drive that ended in a four-yard TD run by Wentz with 0:04 to play. 27-26. With arguably the best kicker in NFL history on the other sideline, Doug Pederson correctly opted to go for 2 rather than try a PAT to force overtime, but Wentz’s pass on a slant to Matthews was batted down at the line. Loss. • Giants at Eagles: Week 3: After a Giants punt left the Eagles with just 13 seconds left to play and the ball on their own 38-yard line with the score tied at 24, Wentz connected on a great throw and catch to Alshon Jeffery for 19 yards, setting up Jake Elliott’s 61-yard field goal. Win. • Eagles at Titans: Week 4: With the Eagles down 20-17, Wentz led a six-play, 27-yard drive down to the Titans’ 12 yard-line, where the offense stalled and Elliott hit a 30-yard field goal to send the game to OT. In OT, the Eagles got the ball first, and drove 56 yards down to the Titans’ 19 yards line, where they were forced to kick a FG. We all know what happened on the Titans’ ensuing possession in OT. Loss. • Panthers at Eagles, Week 7: And finally, in Sunday’s disastrous loss to Carolina in which the Eagles surrendered a 17-0 lead, Wentz and Co. still had a chance to win in the final minute. With 1:17 left to play and the ball at their own 30, the Eagles quickly got a 48-yard pass interference call in their favor which brought them down to the Carolina 22, and it was downhill from there. A near-INT, a run, a missed open receiver in Wendell Smallwood, and a sack-fumble later, the Eagles had themselves a 3-4 record. Loss. One of the things I liked about Wentz coming out of college was his ability to win close games (a highly impressive late drive vs. Northern Iowa in 2014 comes to mind). Wentz is obviously highly skilled, he's smart, and he's ultra-competitive. In theory, he's a perfect candidate for a quarterback who can pick up wins in do-or-die situations. The thinking here is that he'll eventually start converting more of these opportunities, but the reality is that he's currently 1 for 9.